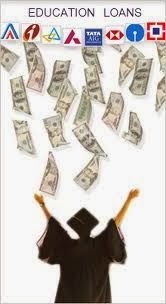 Today pursuing education is one of the most expensive things, for those who wish to study abroad for higher studies. In India it is a prominent problem as more than 1.5 lakh students in India, on an average, search for Education Loan, Student Loan for studying Abroad. The problem is mainly because of deteriorating level of Education in India. According to the “QS World University Ranking” there is no Indian University figuring in the top 200 list. This shows why Indian students want to go abroad for higher studies. The bad news is studying abroad has become expensive than last year due to deteriorating value of Indian Currency. Students are in a state of confusion because of the tragic devaluation of the Rupee against the Pound and Dollar has made the course fee soar at a rapid pace. Many are planning to postpone their plan while others are desperate to seek education loans to deal with the sudden shortfall. Banking sector has always lent a hand to the students with their education since 2001 by providing student loan at reasonable interest rate and without much hassle. However, a majority of students regret their decision of taking a loan. They aren’t able to earn sufficient and struggle to make both the ends meet and deal with their loan obligation. There has been a rise in the number of cases where students have failed to repay loans within the stipulated period. Seeing the NPA figures, the IBA (Indian Bankers Association) is going to revise the educational loan scheme framed in 2001. IBA conducted a survey about the total funding provided to students for education loans. The report showed an expenditure of below 1% of GDP on higher studies is much less than many other developing nations. See the low Tax to GDP ratio, government is planning to fund students through tax revenue. The RBI has also included student loan as a priority sector lending of public banks. Student should know that obtaining loan anyone’s cup of tea. It is in the bank’s hand to sanction loan after evaluating credit worthiness of the student (i.e total assets so that bank can recover loan in case student fails to repay it). Bank usually evaluates student’s credit worthiness by checking the credit history of parents, who are generally joint borrowers. Before granting any loan banks usually go through rating system by checking the employment prospects in the respective field or the employability through placement of the underlying institute before granting an education loan. Banks want to know the possibility of a student to get a good paying job. Certain new changes have been done by IBA to the education loan guidelines. Students should know and understand them before applying for the loan. • Eligibility : Indian Students can apply for loan for pursuing graduate, postgraduate or other courses from reputed foreign universities. • Eligible Expenses : The bank grants loan keeping in mind all the prospects. This includes loan covering fees, hostel fees, library, exam fees, expenses for purchasing books and equipment like laptop, traveling expenses and any other mentioned in the university prospectus. • Finance Limit : Banks grant a max amount of Rs.20 Lakh for higher study. In some special cases more than 20 lakhs can be granted. • Security : A tangible asset of a value more than that of granted loan is to be kept with the bank. The parents are required to be joint owners. • Moratorium Period : The students should start repaying the loan after course completion plus one year or six months after getting the job, whichever earlier. • Tax : Students can avail tax exemption on the interest paid for the loan for a period up to 8 years. I am planning for taking student loan. Can you suggest me any bank in particular to apply for loan? I have a query about the moratorium period. In case if i am unable to repay, will bank give me an extension? If you are planning to take a loan then its better to consider SBI.